You should have seen the other guy, said the plane. The plane, a Boeing 738 operated by Turkish Airlines, was landing at Nevşehir-Capadoccia airport when it got its nose punched in by a flock of birds. 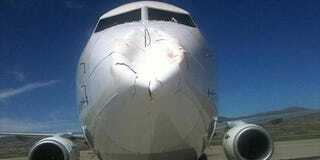 The birds, judging from the marks and cracks and color of said punched in plane nose, presumably suffered a worse fate. So everybody lost. Well, all the passengers of the plane are safe. So that’s cool, I guess.